Baby Bjorn has been transferred to the care of Children's Hospital in Seattle to undergo a new medical trial since the chemotherapy was not as effective as predicted. Baby Bjorn is going through T-cell transfusions, which is explained as a type of treatment in which a patient's T cells (a type of immune system cell) are changed in the laboratory so they will attack cancer cells. ... Large numbers of the CAR T cells are grown in the laboratory and given to the patient by infusion. CAR T-cell therapy is being studied in the treatment of some types of cancer. Baby Bjorn has been through so much since he was diagnosed in June, we pray this is the procedure that helps put the leukemia in remission. The family is now in Seattle and will be for the next 100 days. While he is there, the family is going to need to stay close to the hospital in case he needs to be admitted at any time. The expense of staying in Seattle for the entire 100 days is overwhelming to the family, they will need assistance with housing, food, gas, and many other needed items. The recent update from his mother Amy is that "his ANC is 38 so they can not have any visitors at this time." He was admitted during the T-Cell infusion but he has been able to stay in the hotel for now. They feel he may be admitted again due to his ANC numbers..
His grandmother Dana Bryant stated, "I have come to fully understand why God has told us to not worry about tomorrow for today's worries are enough. This situation has been a battle that has brought so very many people forward to pray for my grandson and assist his family. He is a beautiful, lively little boy who I cannot imagine life without. His mom, Amy, is my youngest daughter and to see her have to go through this battle literally rips my heart apart. She's very reserved. She sneaks away to cry. She doesn't want to make it harder on others. I worked at Walmart for many years, Amy worked there for two and David worked there also. Our former co workers have been very supportive and inquire about Bjorn constantly. My co workers at Sunbirds and David's co workers at Rogers Machinery have been very supportive. Our community as a whole has pulled together friends and family to "circle the wagons,"around the kids during this difficult time. I'm continuing to pray, we are all doing what we can to help them deal with this heart rendering situation. Jade, their daughter worries about her baby brother constantly. We do our best to keep her occupied. She's staying at the farm in Napavine and going to school to keep her mind busy. The house is so quiet without them. I miss hanging out and giving Bjorn rides on my back and binge watching stranger things. Life has evolved into something totally different. We will keep fighting, he is a fighter. We call him the "kraken," because of his temperament. He's my little buddy. They are my heart beat." The extent that this young child has had to go through is more than any of us could ever imagine. 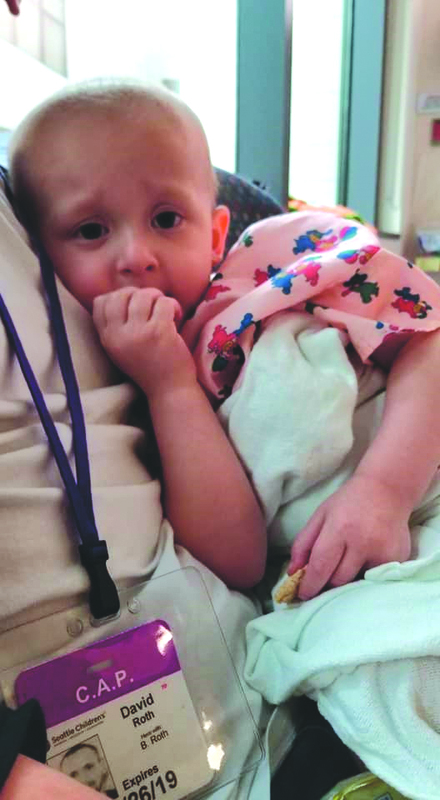 It's hard to imagine a two year old going through chemotherapy only to have it not work and now he has to endure a new medical trial that has shown some success. The family has been at his side the entire time and they will continue to be, but they need help from the community to make this possible. They are hoping to get into the Ronald McDonald house near Children's Hospital but that comes with a cost. David, the father has requested a transfer to the Seattle area for the time being to be close to his family. We have always been a community to come together to help others, this is a time when a family needs all of our help. Whether you can afford $1.00 or more, anything will help. This weekend is another chance for the community to help. The Winter Gala at The Vintage Grand Room at the Historic Washington Hotel will be including Bjorn in their Winter Gala, it takes place this Saturday, November 10th, 2017 from 6:00pm to 10:00pm. They will have live and silent auctions, raffle drawings, music, appetizers, desserts, beer and wine, all for $30.00. This event is to help others as well but we hope the community comes out to support Bjorn as he fights leukemia. There is also a go fund me account under battle-leukemia-with-Bjorn for financial donations. Cash donations can be made at Wells Fargo Bank under the name of "Battle with Bjorn." You can also purchase T-shirts, bracelets and other items at Allstate here in Winlock on Morton road or drop off any financial donations there as well. This family needs our help, let's show this family what our community can do! !